Thanksgiving is just a week away. What are your plans? Thanksgiving is traditionally a day when families get together for a special meal. The meal often includes a turkey, stuffing, potatoes, cranberry sauce, gravy, pumpkin pie, and vegetables. But what if you are a senior and your family is too far away to visit, or your son and his wife are spending this year with her folks? Don’t let that get you down. Host a Friendsgiving. Friendsgiving is a combination of the words friends and Thanksgiving. Held on or near Thanksgiving it is a time when friends get together to share a meal like the traditional meal shared with family. 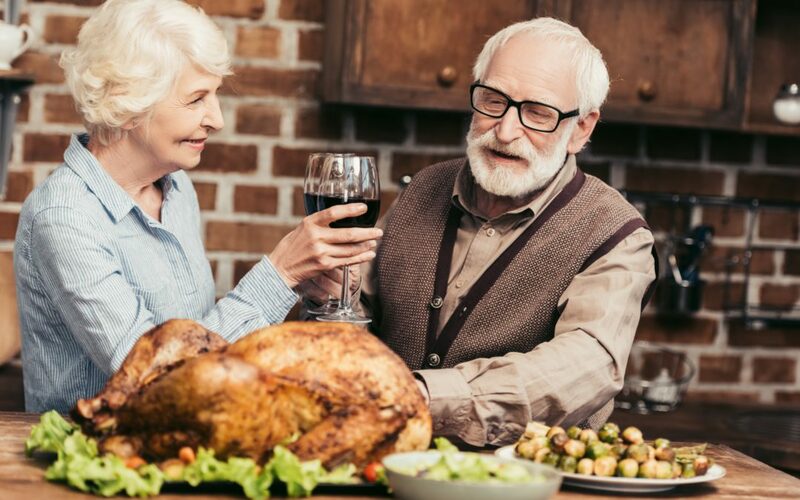 If you live in a 55+ community, you may find others who can’t spend the day with family and are looking for something to do – a perfect time to host a Friendsgiving. If you find the idea of preparing a big Thanksgiving feast a bit overwhelming, don’t despair. Because a turkey is too unwieldy for travel, that duty falls to the host. But your friends will be so happy you’re hosting, they will gladly bring a side dish or a bottle of wine. Want to do something totally different, how about brunch instead of dinner? You can make it as casual or formal as you like. Do you have fine china you don’t bring out when the grandkids are around? This is a party for grown-ups, dress it up! If your friends are more into jeans and sweaters, then jeans and sweaters it is. Before dinner you might want to get your friends engaged in a little Thanksgiving Trivia. Click here for a printable Thanksgiving Trivia quiz (with the answers). Autumn can be a beautiful time of the year. Once the meal is over a little exercise might be in order. Many senior living communities have walking paths. On a nice, brisk, autumn day a walk with friends to enjoy the fall foliage could be fun. Then back home for coffee and dessert. If you have no plans for Thanksgiving, give a quick shout out to your friends and host a Friendsgiving. They’ll be grateful you did.